Popcorn had been around for awhile when brothers Frederick and Louis Rueckheim, candy entrepreneurs in Chicago, came up with the idea of coating popcorn in molasses and adding peanuts. They debuted their product, which had the snappy name “Candied Popcorn and Peanuts,” at the Chicago World’s Fair in 1893. The molasses proved too sticky, so they went back to the drawing board and eventually developed a process that made the coating crispy and dry and kept the kernels separate. A customer tried a sample in 1896 and exclaimed, “That’s crackerjack!” – turn-of-the-century slang for “that’s really good.” Crackerjack is considered a type of caramel corn because the molasses is caramelized before being poured over the popcorn. See yesterday’s post for information on the caramelization process. Other competitors followed suit, many using caramel instead of molasses, and the caramel corn industry took off, particularly in the 1930s and ’40s. Popular brands include Fiddle Faddle and Crunch ‘n Munch. Nowadays, you can’t go to any farmer’s market or county fair, it seems, without bumping into a caramel popcorn vendor somewhere. 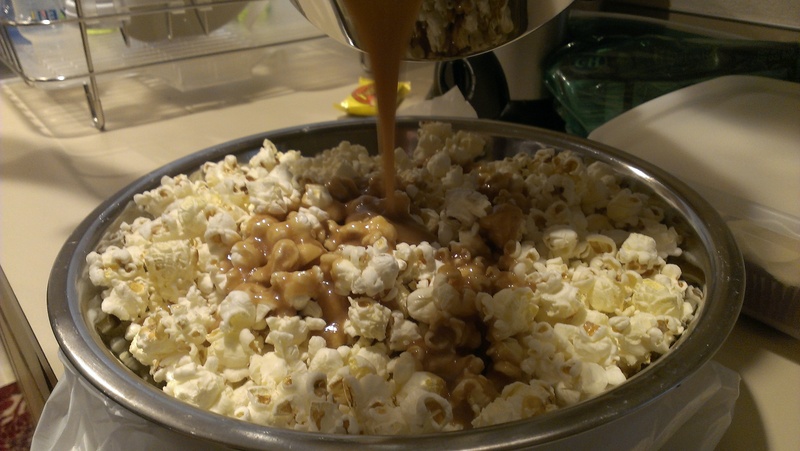 The art of making caramel popcorn.